80 MMS September 2017 mmsonline.com FEATURE teams was also a proving ground for process management, even if no one realized it at first. WHEELS UP The reason for shifting toward a new market is simple: A healthy business is a diversified one, and NASCAR is a limited market. The aerospace sector pre sents broader oppor tunit y, not to mention more revenue per part in most cases, Mr. Ickler says. Aerospace and defense contracts also offered the advantage of an organic transition. Long, heav y roughing routines, tight radii, sculpted surfaces, smooth blends—all were commonplace for Ickler Manufacturing long before the first aerospace prototype, and the shop had experi- ence with materials like titanium and Inconel as well. Given similarities in par t geometries and materials, the shop has been able to adapt to the realities of its new competitive space largely at its own pace. At the heart of this technological foundation is a long-standing focus on high-speed, five-axis m ac hining. M r. Ic k l e r s ays h e's n eve r re a ll y considered anything else, recalling time spent watc hing mac hining-re late d inte r net v id e os trackside, on planes and in hotel rooms while under a NASCAR contract but not actually driv- ing. The first five-a xis machine was installed about a year and a half after he wrote his very first CNC program. 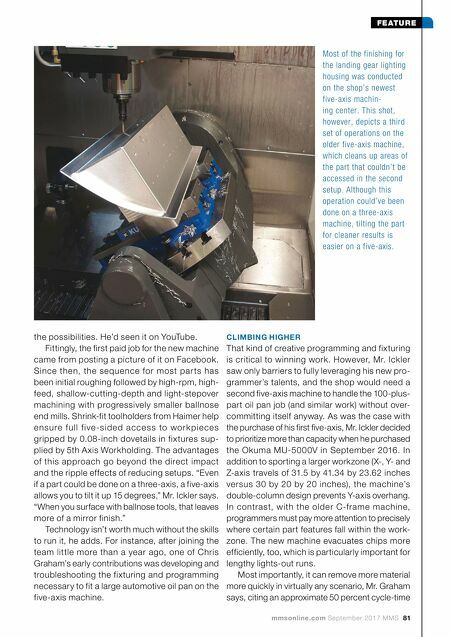 That's despite the fact that the shop was already thriving on three-axis VMCs with fourth-axis rotary tables and that the primary need was capacity, not capability. Although he'd never programmed in five axes, he understood Shop owner Brian Ickler shows off a housing for aircraft lighting (a part for this same assembly is vis- ible on the Okuma MU5000V on the previous page). 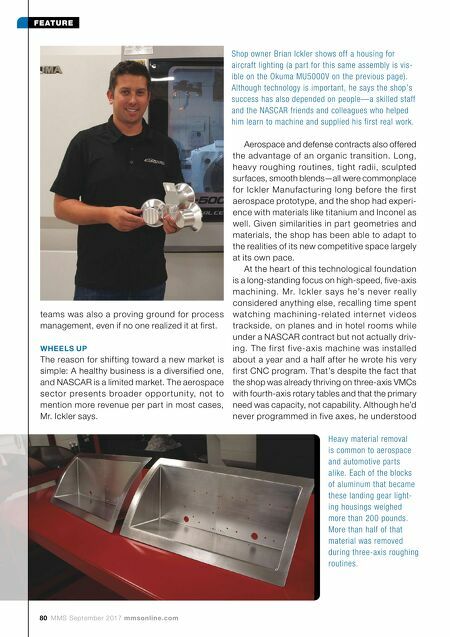 Although technology is important, he says the shop's success has also depended on people—a skilled staff and the NASCAR friends and colleagues who helped him learn to machine and supplied his first real work. Heavy material removal is common to aerospace and automotive parts alike. Each of the blocks of aluminum that became these landing gear light- ing housings weighed more than 200 pounds. More than half of that material was removed during three-axis roughing routines.